Avid readers of my blog (are there any other than my mum? Probably not) will already know about Crown Brewery and my love for them. Read me raving about it here and here and visit their website here. So, this is one of their jaaazzz (one can’t say jazz without stretching that “a”) beers, a series of beers named after classic jazz musicians. As far as I can tell the musician and style of beer aren’t really linked, beside it being a nice name. I’ve not had any of Crown Brewery’s other jazz beers, indeed I’ve never even seen one before, and I didn’t realise the series even existed until I browsed the brewery’s own website. So, what’s this beer like? Well, it’s a Double Damson Porter. Well, I assume the double relates to the use of a Belgian yeast strain (maybe?) the damson relates to the fact that they brewed the beer using damson for the sugar, rather than boring old sugar itself, and the porter refers to the fact it’s brewed dark and rich using roast malts, like what porters are. Now, I don’t like criticising this beer. Crown Brewery have always impressed me, and this beer was brewed with the assistance of Zak Avery, a man whose company I’ve enjoyed while perusing his excellent store Beer Ritz and whose blog I religiously read/watch. But, this beer has not quite hit the spot for me. It poured a lovely deep, dark brown, almost black colour with maybe a hint of damson-y purple (but that might be my brain playing tricks), but it also poured completely and utterly flat. No head, no carbonation, no nothing. I’m no fizz enthusiast, indeed, I prefer my beers too flat to too carbonated, but the complete lack of carbonation left the flavours rather flat and the nose nigh-on nonexistant. So while I enjoyed those deep, roasted, espresso flavours of the malt, that bitter kickback and those lingering, sharp, tangy fruit notes, it just all seemed to attack my palate at once, rather than presented itself nicely and ordered as I hoped. And my hopes were high. I had this on draft at North Bar back in December and while I took no notes, I remember being massively impressed. It was vibrant and fully flavoured. One of the three above points would also explain why the aforementioned Zak Avery loved it while I did not. I’d say that I’d like to try it again and see whether this was a one off. But, as far as I know, there’s none of this left. So we’ll have to wait for the next time it’s brewed. Time to fess up. Were it not for the splendid Zak Avery at Beer Ritz I would probably never have heard of Crown. 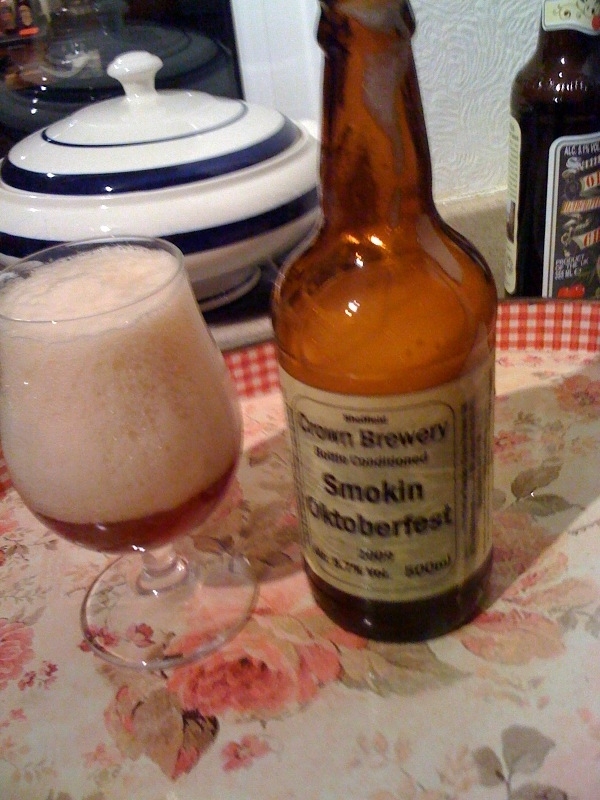 I was skulking around his shop looking for some choice Oktoberfest ales, and Crown’s Smokin Oktoberfest – despite being from Sheffield which, last I checked, is nowhere near Germany – was, so I was told the pick of the bunch. I believed Zak (well, you have to believe someone who’s an award-winning beer writer, right?) and bought the beer. It’s still in my cellar (read: damp basement) now, waiting for the right time to be supped. But it that time, the aforementioned Avery shoved a bottle of their Wheat Stout in my hand, and also recommended the Unpronouncable IPA. 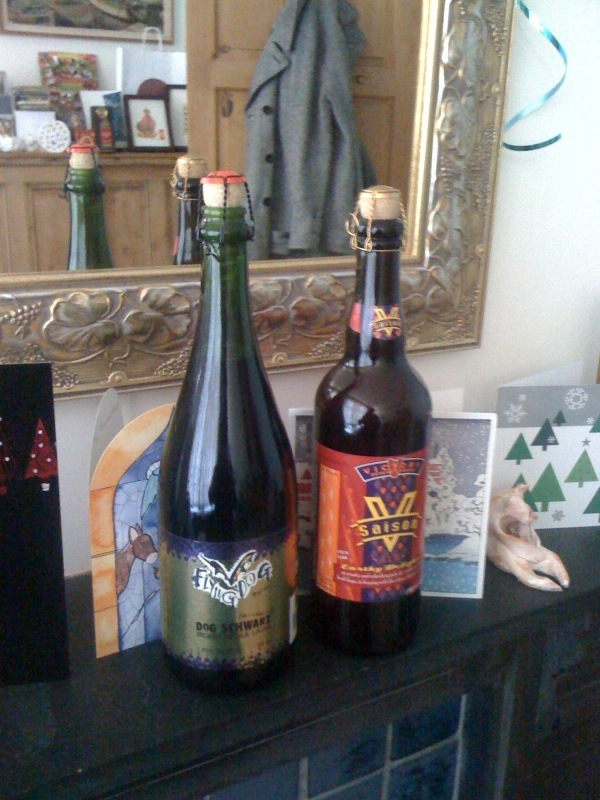 I got both, drank my Wheat Stout last night and have an Unpronouncable IPA by my side right now. And thank bloody god that I do. This is good stuff. So who are Crown Brewery? It’s a microbrewery from Sheffield (as I’ve already told you) based in the cellar of the city’s Hillsborough Hotel. It’s name comes from another brewery that once existed on the other side of the road in the 1930s. It got a new lease of life in 2006 when new owners took over the pub and brewery, and since July 2007 they’ve employed the services of Stuart Ross, formerly of Acorn and Kelham Island breweries. I’ll start with the Wheat Stout (because I’m still savouring the IPA now). 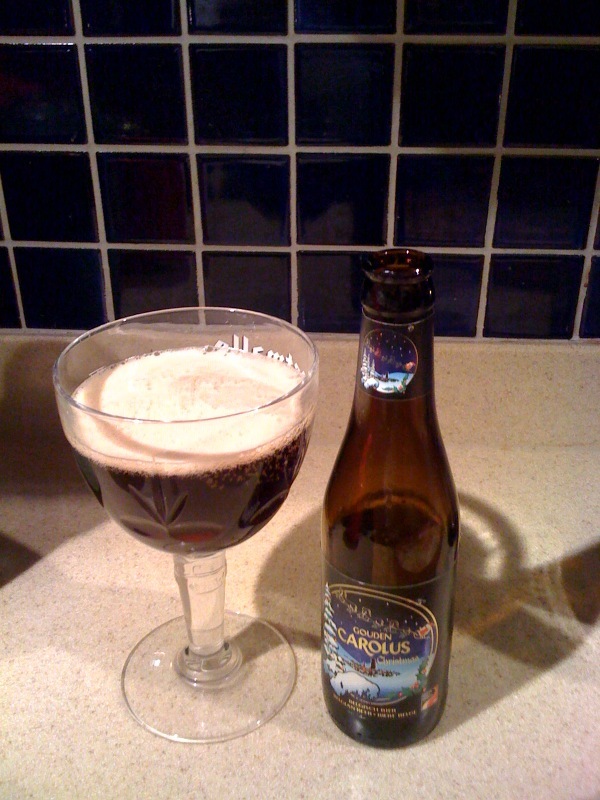 It starts promising, pouring out a rich, deep black, with a dark, creamy head. It doesn’t take much for the nose to get impressed either – it comes out all powerful and surging with bitter coffee and dark chocolate forcing its way up the nostrils. It promises for an impresive stout, and as its sips, it delivers as you would expect. The longest-lasting and most prominent flavour is liquorice, a whole heap of liquirice, but those chocolate and coffee notes kick in too, while the powerful, warming finish is biscuity – digestive biscuity to be precise. The Unpronouncable is, I assumed so called because its a hefty – or,if you will, traditional 7%. That’s a little closer to what the original IPAs were meant to be (they had to be strong to surive the crossing to India, see). Certainly a great deal of words could become muddled, stumbled over and generally tough to say after a couple of bottles of this. Just because it’s pretty strong doesn’t mean that this ain’t subtle. Have no doubt, this a clever beer. After appreciating the golden colour and lovely creamy head, the first thing you get is blackberries. Yep, blackberries. Thanks, so the brewery say to their Bramling Cross hops, this is a gloriously fruity beer designed, in the brewery’s own words as “a nice adversary to the super-hopped US-style IPAs”. They succeed in doing so. Yep, this is nicely bitter – but not overly so. 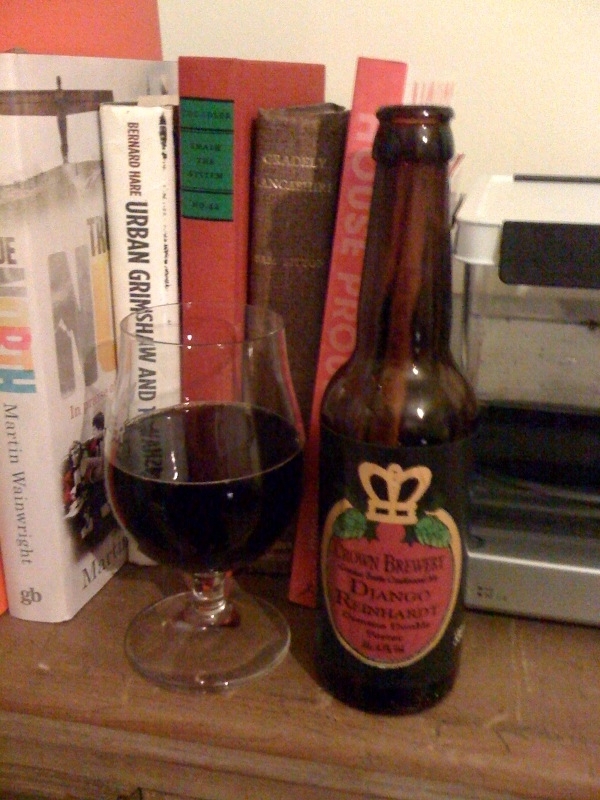 And once you’ve got your head round those lovely fresh blackberry flavours (help, no doubt, by Crown’s insistence on bottle conditioning), you get a slight bitter apple finish. Is there a better combination of flavours for the autumn? The best bit of all this (for me) is that I still have the Oktoberfest beer to try. I shall my thoughts on that when it’s opened.